If you’re a goo d and enthusiastic cook or baker, you’ve probably been told “you should sell these!” And maybe you’ve given it some thought. We’ve got a new book, Good Food, Great Business, to provide you the know-how to make that thought a reality. The subtitle, “How to take your artisan food idea from concept to marketplace,” is true to its word. Chapters cover everything from mission and vision creation to sourcing ingredients, producing, packaging and pricing your product, and setting up your business. 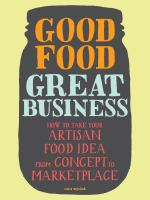 Packed with information, tips, and checklists, this book can get you started on your own great food business. And when you’re ready, the library has lots of online business resources to help you, all available with your library card.. These include: Business Source Premier for journal articles and market reports, ReferenceUSA for market research, and Legal Forms for standard legal and business forms.